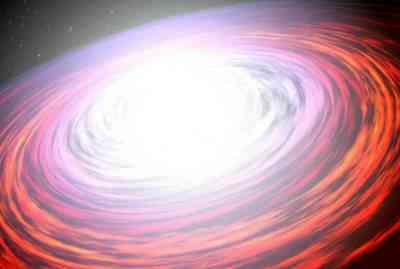 Astronomers discovered neutron star - Solar System Planets And Moons Section. Three Space Telescopes Find a Neutron Star..
An international team of Astronomers have discovered a hidden neutron star using three different space observatories: Integral, Swift and Rossi. The object, called IGR J16283-4838, is part of a binary system which is shrouded in thick layers of dust that obscure our view from Earth. Astronomers were able to detect it because it released a blast of gamma and X-rays that penetrated this shroud of dust. It took all three observatories to pin down the source of this blast of radiation as a Neutron star. In this beautiful image, Saturn's shepherd Moon Prometheus hovers above the planet's A and F rings. It's also possible to see bright clouds on the surface of Saturn, passing through the ring shadows. This photograph was taken by NASA's Cassini spacecraft on June 3, 2005, when it was approximately 2.1 million km (1.3 million miles) away from Saturn. Supercomputer Will Study Galaxy Evolution. A new supercomputer has been installed at the Rochester Institute of Technology to simulate the interactions between black holes and the evolution of galaxies. Known as the gravitySimulator, this computer will run simulations that calculate the gravitational interactions between thousands of individual stars. It can achieve a top speed of 4 Teraflops (4 trillion floating point instructions a second), making it one of the top 100 supercomputers in the world. As techniques and equipment for finding extrasolar planets improve, Astronomers are finding planets with smaller masses. First it was Jupiter-sized planets and larger, then Saturn-sized planets, and now Neptunians. But could these Neptune-mass planets actually be terrestrial planets, made of rock instead of gas and ice? Unlike Neptune and Uranus, these planets orbit very close to their host star. Astronomers will need to find one that transits in front of its host star to they can determine its density, to know if it's rock, ice or gas.